It's very fortunate that there are a wealth of contributors on this forum who have solutions for the questions I have posed. I'm in the process of designing the corrosion protection system for my 31' aluminum boat. The hull is made of 5086-H116 1/4" aluminum and the boat will be used exclusively in fresh water (Lake Michigan). In addition, the boat will be kept out of the water on a trailer when not in use. 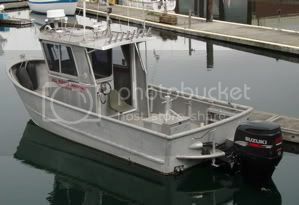 It will be powered by outboards. 1. Use a Charles Isolation Transformer to completely isolate the shore power ground and power wires from the boat's electrical system. 2. Use magnesium hull anodes to protect the exterior of the hull from stray current damage. 3. Electrically bond the inside of the hull at one point only to the boat's negative ground system. 4. Enclose all wiring/cable runs inside PVC conduit to help prevent stray current corrosion from wiring insulation which could wear through. 5. Properly secure cables where necessary to keep them from flexing due to vibration/motion etc. 6. Make sure all electrical components have a negative or neutral return path back to the appropriate bus, never using the hull as a return conductor. 7. Ensure that all wire runs are protected by the correct size circuit breaker or fuse. Is there anything I missed? I have one question about bonding the anode to the hull. If the anode is securely attached to a clean unpainted spot on the hull, is it necessary to bond this connection inside the boat back to the negative bus with a bonding conductor or will the connection to the hull suffice? Thanks in advance for your suggestions. These are all somewhat good ideas if not a little over the top in some cases, particularly since you don't have intention to leave the boat in the water. For instance your shore power isolation transformer would come in handy if you were planning on long term mooring in a decrepit marina full of poorly wired old commercial boats, a green ground wire isolator would typically be sufficient. Be careful of using magnesium anodes in anything other than crystal clear (low conductivity) water otherwise you could find yourself "overprotected", mil-spec aluminum anodes might be more appropriate. Your PVC conduit idea is definite overkill, item #5 is all you need to do. #s 3, 6 & 7 are good practice. No need to connect your hull anode to the negative buss. That said it is better to use an anode that mounts on threaded SS studs that keeps the anode material suspended slightly off of the hull thus forcing the conductivity through the studs instead of relying on physical contact between the anode material and an unpainted spot on the hull as that contact area will be constantly degrading.